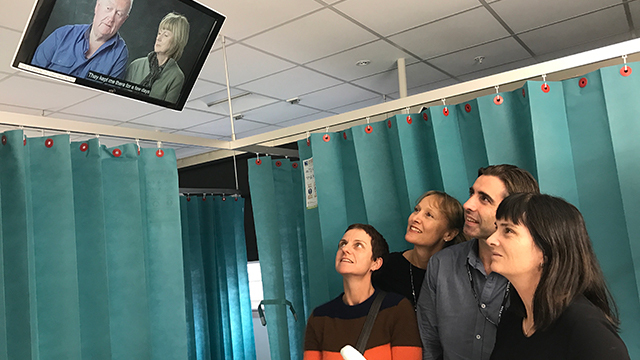 More than 10 million Australians* are set to benefit from Australia’s newest Health TV network, launched this month in hospitals across the country. Patient education and health promotion specialist Healthily, has joined with Hills Health Solutions to officially launch ‘Healthily TV’, now available at more than 18,000 beds across 80 hospitals – and growing. According to Hills Health Solutions Head of Health, Darren Osborne, Healthily TV provides dedicated patient education and entertainment. “Our patient audience is growing as hospitals become increasingly aware of Healthily TV’s value in improving patient experience and outcomes” Mr Osborne said. Healthily TV presents a unique advertising opportunity for organisations to reach large, captive and receptive audiences. The patient’s hospital room, unlike waiting rooms, provides a one-on-one engagement with the screen and the health content. Advertisers get effective combination of both reach and frequency as patients stay on average between 2.3 and 3.2 days per visit  and adult patients spend many hours watching their bedside or in-room TVs. A study investigating daytime television viewing by hospitalised children found that the period of time television was viewed in hospital increases with age, with the 8-11 year age group viewing 5.5 hours per day.  . Patients, and their family and friends, have access to three main channel types – Healthily’s free generic patient education channel, free ward specific education channels*, and paid movie/commercial TV channels. Ads, advertorials or sponsored health content are shown across all free channels and paid movie channels. Dr. Tina Campbell, founder of Healthily said “At Healthily our vision is to encourage and empower patients to play a more active role in their health by providing them with relevant, evidence-based online information and resources. “The content on each channel is designed to entertain and build the viewers knowledge, skills and confidence to manage their health to the best of their ability,” she says. In Healthily’s vast evidence-based content library, hundreds of people share their diverse health experiences in fascinating and informative video case studies. “Patients are interested, engaged and receptive to health messages from people sharing their personal stories about specific health conditions. Research shows this engagement improves patient confidence about self-management of their conditions,” Dr Campbell said. Mr Osborne says the launch of Healthily TV comes at an exciting time. “The imminent introduction of new interactive touch screens (IPTV screens) to hospitals will further boost patients’ engagement with the content”. “The IPTV screens will give patients access fun, interactive entertainment and education experiences, including quizzes and games. These quizzes and games can incentivise or reward patients in creative and fun ways for actively engaging with the content,” he says. Dr. Campbell said “We will also trial providing patients with functionality that will enable them to send educational content to themselves or their carers via our GoShare Healthcare online content sharing platform. This will enable them to create and send themselves content bundles, via email or SMS, so they can continue to learn more about self-managing their condition after their hospital visit”. “The digital distribution of educational material is our key focus. The digital content complements the face-to-face interaction with a health provider. It is all about scale, it is all about taking a very holistic, efficient and effective approach to health promotion.” Dr Campbell said. 1. Australian Institute of Health and Welfare, Australia’s hospitals 2014–15 at a Glance: Health services series no. 70 July 2016. p. 19. 2. Waldner Guttentag, D.N., W.L. Albritton, and R.B. Kettner, Daytime Television Viewing by Hospitalised Children: The Effect of Alternative Programming. Pediatrics, 1983. 71(4): p. 620. *Gross annual reach is 10,107,692 people based on 18,000 screens, an average hospital stay of 2.6 days and four viewers per screen (patient + three carers/family). Patients, and their family and friends have access to Healthily’s free generic patient education channel, free ward specific education channels, and paid movie channels – each offering unique and targeted advertising opportunities. Ward specific channels available last quarter 2017. Hills Health Solutions is Australia’s leading provider of interactive patient care for the hospital and aged care sectors, including communications, nurse call, monitoring and entertainment systems. Hills has a presence in over 350 Australian hospitals and 600 aged care facilities.